Bueno familia, maybe you have noticed that I have a new EP out. This is released via Chiles KONN Records and it’s called “Messages from outta Space” and this is the first of 3 CumbiaBass EPs with different directions coming soon. Andrés Digital comes from Darmstadt Germany and is searching for the perfect crossover. Besides musical Crossovers this includes merging past and future together in the present. So you will find old Melodies and fresh Beats, you will find MCs and Singers like Toots and the Maytals, Bob Marley, Sean Paul, Los Rakas, B-Real, MC Zulu, Gorillaz, Tony Matterhorn and many more – you will find Rock guitars and Surf guitars – everything mashuped very well. 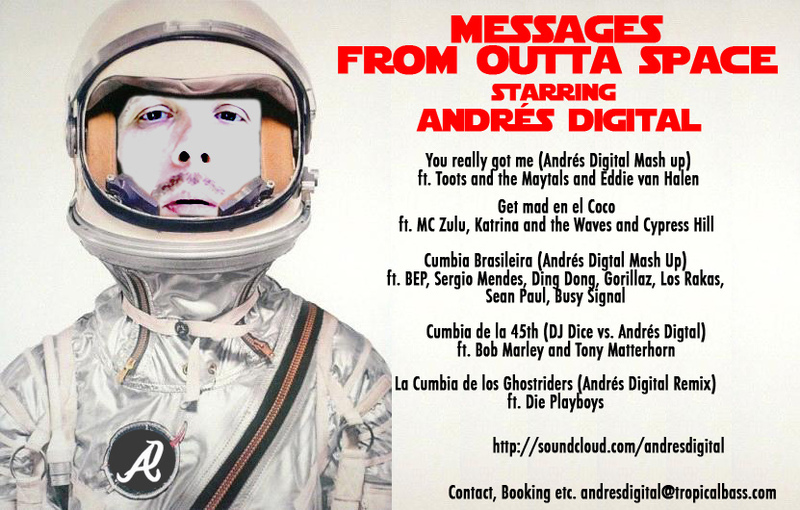 “Messages from outta Space” is Andrés Digital’s 3rd EP and while he featured Cumbia and Reggae on his prior EPs (which was a big success), this one is dedicated to the more Tropical, Moombah and 3ball side of Life (but you will also get Ska, DemBow and Jungle). MashUp the Styles, free Music for Free People !! Qué viva la Cumbia!! Messages from outta Space – Andrés Digital from Andrés Digital on Vimeo.